On 17th March 1906, a son was born to Smt. Jhaverbai and Seth Doongursee Shamji Joshi, in Karachi. As Maharaj Doongursee (as Seth. Doongursee was also referred to) who was a leading cloth merchant and broker of the city remarked, his Prince of Wales arrived in the world on the same morning as the British Prince of Wales landed at the Gateway in Mumbai. The child was named Manoobhai and he would prove to be a long-lived and worthy scion of this illustrious Pushkarna Brahmin family. The young Manoobhai had his earliest schooling in Mumbai, where the family had its roots, at the Esplanade High School. He was a good student, but due to unavoidable circumstances his scholastic career was cut short in his mid-teens and he had perforce to join his father’s trade in 1921. However, Manoobhai remained a voracious reader and continued to expand his knowledge of the world and of business. He developed a very good command over the English and Gujarati languages, as is evident from the clear, well-composed letters he wrote. In Karachi the young Manoobhai followed in his father’s footsteps and showed the same business acumen as Seth Doongursee Joshi, who was already an important merchant and the main broker for Mumbai’s famous textile manufacturers M/s. David Sassoon and Co. Ltd. Seth Doongursee was also an acknowledged leader of his community, being elected in 1919 as the President of the All-India Pushkarna Brahmin Conference and was keenly interested in the advancement of education. Seth Manoobhai also quickly rose to eminence in the business circles of Karachi, being appointed a member of the Board of Karachi Port Trust (1930-32) and the Vice-President of two trade associations. His business interests covered wool, silk and textile trade, newspapers, Fire Insurance, General Insurance, Safe Deposit Vaults, Land improvement and Equity Investments among others. He rose to be a Director in at least eight companies and an office-bearer and member of various committees, trade delegations, health associations and educational institutions. He was the President of the Gujarati Education Society and was to hold the post for 21 years by the time he left Karachi. At the time of Partition, almost one-third of Karachi’s population was Gujarati. 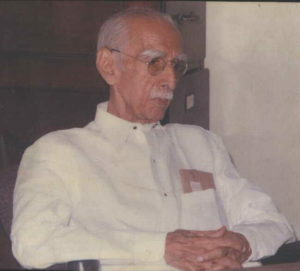 In order to reach out to these masses, Seth Manoobhai started the Gujarati daily Sindh Sevak, which informed the people of the fast changing political developments in the country. Seth Manoobhai had also inherited from his father a love for animals, especially cows and a commitment to their welfare. In Karachi and later in Mumbai Seth Manoobhai was closely connected as Trustee with various Animal Shelters (Panjrapole). He was the Chairman of the Bombay Panjrapole and the Honorary Secretary and Trustee of the Bombay Gow-Rakshak Mandali for the last 30 or more years of his life. He worked very hard towards the banning of cow-slaughter and for improving the breed of cows through crossbreeding. Shri Manoobhai also organized the Fodder Research and Grass-Land Development Institute, which was recognized by the Konkan Krishi Vidyapeeth (Agricultural University) and the Government of Maharashtra. In recognition of the depth of knowledge he possessed and for the meritorious contributions that he made, the Indian Society for Study of Animal Reproduction (ISSAR) awarded him a Fellowship in 1981. The Cattle Breeding Farms at Betegaon and Kandivli, conducted by the Bombay Gow-Rakshak Mandali, were made into recognized Research Centers by him. There facilities were made available to the post graduate students of the Agricultural University (Konkan Krishi Vidyapeeth) at Dapoli and of the Bombay Veterinary College, whom he further encouraged and supported with scholarships. These activities were designed ultimately to be useful to farms and farmers in India. Shri Manoobhai’s devoted work for cattle development and for the Bombay Gow-Rakshak Mandali resulted in the winning of the Gopal Ratna, the award given by the Government of India for the highest milk-yielding cow. In Mumbai, Seth Manoobhai’s business interests were more focused on the Wool Trade and he headed two trade associations as President for several years at a time. He was a keen investor in Equities on the Bombay Stock Exchange. His philanthropic work also extended in many directions and he generously supported several institutions, the David Sassoon Library being one of them. Shri. Manoobhai was also the founder trustee of the Madanmohanlalji Temple Trust and was solely responsible for bringing the deity from Karachi and the reestablishment of the temple situated at Jogeshwari. His father had also passed on a family tradition of servcice to education to Seth Manoobhai. Even more staunchly, Manoobhai believed in promoting the education of female children and of ensuring them equal opportunity with males. As the President of the Gujarati Education Society (Karachi) from 1926 to 1947, he had founded the Shrimati Jhaverbai Doongursee Mahila Vidyalaya, a girl’s high school named after his mother. So strongly did he advocate the education of girls that he personally went from door to door persuading parents to send their daughters to school. Seth Manoobhai succeeded excellently in his mission and the school expanded rapidly to more than 750 girl students. In 1922, Seth Manoobhai had brought home his very young bride, Maniben. They were to enjoy more than seven decades of loving companionship and mutual devotion. They provided great moral support to each other. Shri Manoobhai encouraged by his father arranged for the education of his young wife, so that she could learn English and music, as she desired. Maniben enthusiastically shared her husband’s commitment to social service, the education of girls and animal welfare. The young couple however had to abandon their business interests and life in Karachi in 1947 and they moved to India with their daughters Damayanti and Pushpa and their only son Kirti. In another year Seth Manoobhai took up business again. Kirti was the youngest of the children and had been born on 19th November 1940. The seven year old continued his education at the Cathedral & John Connon School, in Mumbai, turning out to be an excellent sportsman and cricketer. Seeing his academic brilliance, his fond parents planned to send him to England for higher studies specializing in Mill Management as his ambitious father had always had the dream and the know-how of running his own textile mill. But who can foresee or forestall destiny. Kirti’s untimely death in a scooter accident on 18th April 1957 stunned the family and robbed Manoobhai of his only son. Manoobhai’s stoic and outwardly calm manner of dealing with this tragedy in fact shattered him from within. The distraught mother, Maniben, decided to perpetuate her sixteen-year-old son’s memory with an educational institution named after him. She contributed her entire life’s savings to the cause and Seth Manoobhai too made a substantial donation. They selected the Kirti M. Doongursee College, which was then known as Bombay College run by the Deccan Education Society of Pune. At that time the college building was much smaller than it is now, consisting mainly of what is today the laboratory wing. The donations from Maniben & Manoobhai Doongursee and their daughter Smt. Pushpa Bhatia helped the college to build a vast extension, containing today’s office and library wing (ground floor) and classrooms and Reading Hall on the first floor and the Computer laboratory. A massive oil portrait of Kirti Doongursee dressed in cricketing gear, bat in hand graces the Library’s Reading Hall on the first floor, watching over the studious preparations of generations of teen-aged students like himself. The college that bears the name of their son became to the Doongursees, an important and very dear part of their lives. In the words of Kirti’s elder sister Pushpa Bhatia, Maniben was especially keen to make Kirti College ” a center of excellence” and gave generous donations to upgrade the college facilities, as and when these became necessary. The college canteen and Hostel, the renovation of the college building and laboratories and several other amenities bear testimony to this. Seth Manoobhai along with his family regularly attended the Annual Day Celebrations of Kirti College as long as health permitted him. His last visit to the college is a memorable one for the college staff. It was on 16th April 1994, when he hosted a get-together of his family with the whole teaching and non-teaching staff of Kirti College. Frail as he was, he personally went around meeting each and every teacher present in the room. On that occasion, he released the College Magazine of 1994, which contained a tribute to his late wife Maniben who had passed away nearly three months before. He addressed the gathering speaking with obvious love and idealism, in a voice softened with age but still worth hearing. Almost shyly, he announced a large scholarship in memory of the late Maniben Manoobhai Doongursee. When Mrs. Pushpa Bhatia is asked about her father Seth Manoobhai she remembers him as a strict but loving parent, a man of few words, held in awe by his children, and generally undemonstrative about his affections. However, he loved children and his little great grand children were the delight and joy of his declining years. In business circles and in society, Seth Manoobhai was acknowledged as a man of extreme honesty and uncompromising integrity, which could not be questioned even by his worst enemies. He lived up to his Gandhian ideals: living a very simple austere life, wearing Khadi, having the fewest needs, and never being complaining or demanding in his behavior. The one thing he hated was dishonesty and he abhorred those who took advantage of others or cheated them. Modest and unassuming by nature, he never wanted or expected applause. He believed in selfless service and lending encouragement and support to others. The love and reverence his former employees still bear towards him is ample testimony of his fair dealings, his service and his enrichment of their lives. His sweet and charming manners won the hearts of all those around him. Seth Manoobhai was very much involved with the Ramkrishna Mission and was deeply influenced by the teachings of Swami Vivekananda. Rational by nature, he was not at all superstitious and did not care much for rituals. His life showed that he had chosen the Path of Karma Yoga (Good Deeds) and was always true to his Dharma. His daughter Pushpa testifies that he passed on these values to the younger generations of his family, Pushpa and her son Rajiv, by exemplifying them in him, rather than by preaching about them. For the last few years of their lives both Manoobhai and Maniben were emotionally very dependent on their daughter Pushpa, as she acknowledges. Manoobhai was even more so after the tragic and brutal loss of his dearly beloved wife as the result of a robbery and assault at their residence (the guilty roam free today). At the ripe age of 90, Manoobhai reportedly confided to his doctor, “I’ve lived a very good life: never compromised on my principles. I’ve done all the social work I wanted to and I’ve done it my way. God has been very kind to me. There is nothing more to achieve. So now it’s time for me to go.” A few months after his 90th birthday, Seth Manoobhai’s health failed gradually and he breathed his last on 19th May 1996. With the passing away of Kirti Doongursee’s father, those at Kirti College too have lost a father-figure: a benevolent, noble and kindly soul, who fulfilled their needs as those of his children – quietly, lovingly, generously, without fanfare or ceremony. The family of Kirti College – students and staff – offer their humblest respects and homage to the memory of their magnanimous donor Seth Manoobhai Doongursee.